With the Omnii XT15 Series, Zebra offers custom-made versatile, robust mobile computers. There are many versatile configurations available ten keyboard layouts, a 1D or 2D scanner, WWAN, GPS, RFID, Push to Talk, a scratch-resistant display and much more - you put together what the application requires and therefore get precisely what you need. This makes the versatile mobile computers optimal for usage in production, logistics and in light industry. The Omnii XT15 also makes a good impression in cold storage environments - the freezer version of the mobile computer withstands extreme temperatures down to -30C. Tailored configuration ten keyboard layouts, barcode scanner, RFID, pistol grip, PTT, etc. Operate the bright 9 cm 3.7 touch display comfortably either with a pen or your finger -available either as the standard or extra hard-wearing version. Depending on the requirements choose from various keyboard layouts with between 34 and 66 keys. 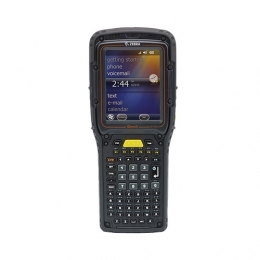 The 800 MHz processor ensures for the necessary speed, plus the operating system comes pre-installed with either Windows CE 6.0 or Embedded Handheld 6.5. Zebra XT15 cradle - Charging and communication cradle for Zebra XT15, USB, incl. power supply (ST1050) and USB cable. Zebra XT15 cradle, Ethernet - Charging and communication cradle for Zebra XT15, USB, RS232, Ethernet, incl. power supply (ST1050) and USB cable. Zebra charging station - Zebra charging station, 4-slots, fits for: XT15 series, order separately: power cable.